For anyone who is completing the Timetable Consultation Response for the Redhill area here are our guidance notes for responding to the questions. Of course, feel free to amend or adjust as you prefer. Importantly you don’t need to answer every question as reflected below. The full timetable consultation information can be found on the Southern Railway website. Do you support proposals to approach engineering works differently? Please select all options you support. Any further comments on this proposal? RRDRUA supports the principle of setting specific times each week for maintenance. For Example, we would be happy if on Monday and Tuesday nights the 23:02 from Victoria was the last train to Redhill on Monday and Tuesday nights, provided that bus services would be provided for later passengers to return from London as shifts do not change just because the Railway is closed. However, we would like this to reciprocated by additional late night services to Redhill Line. For example, later services to Reigate, Merstham, Earlswood and Salfords plus overnight London to Gatwick trains calling at Redhill right through the night on other days. Additionally, earlier morning services to Gatwick from Merstham, Redhill, Earlswood and Salfords arriving at Gatwick before 5am for shift workers. Do you support the proposed frequency increase for Thameslink services at Luton, Luton Airport Parkway, Harpenden, St Albans City, Radlett, Elstree & Borehamwood, Mill Hill Broadway and West Hampstead Thameslink with the introduction of a new semi fast service? Do you support the proposal for Thameslink services on the North Kent line serving Greenwich, Abbey Wood, Dartford and Medway Towns? We are concerned that we are constantly informed our services cannot be increased because of the need to avoid flat crossings at Stoats Nest and Tinsley Green, yet here is a proposal that will create another flat junction that will affect reliability of our trains. Do you support the proposed increase in frequency of Thameslink services on the Catford Loop line? Do you support the proposal for Thameslink Maidstone East services to operate via London Bridge instead of Elephant & Castle restoring train services previously withdrawn in 2009? This question does not directly affect our services. We are though pleased that the number of trains between Thameslink core and London Bridge is remaining with the loss of Caterham/Tattenham trains. On balance do you support the retention of Caterham and Tattenham Corner services as part of Southern South London Metro? Proposed improvements for the Caterham and Tattenham Corner routes include longer 10 carriage trains and other off peak enhancements (full details in Southern South London Metro section). This question does not affect our services directly but it seems sensible for the passenger numbers and to relieve pressure between Windmill Junction and Thameslink. Any other comments in relation to the expanded Thameslink network from 2018? The principle of through trains form London is accepted as it increases the ability to create more services. We are disappointed that this proposal does not increase services through the Redhill Lines. Specific comments can be made on individual services within each sub route in the survey. TL1/2 – RRDRUA would support the overnight service between Bedford to Gatwick take on the stopping pattern of TL2 not TL1 south of London. That is to call at Norwood Junction, East Croydon, Purley, Coulsdon South, Merstham, Redhill, Horley and Gatwick to provide a commuting train service for shift workers at Gatwick Airport. This is an important need which there is no public transport option currently. TL2 & TL5 Stopping pattern between Gatwick and East Croydon. We appreciate the careful planning of the stopping sections of these trains. We would recommend this be swapped over. That is TL2 should stop at East Croydon, Coulsdon South, Merstham, Redhill and then Gatwick Airport. Then TL5 should stop at Norwood Junction, East Croydon, Purley, Redhill, Earlswood, Salfords, Horley and Gatwick Airport. This would benefit Earlswood, Salfords and Horley customers who can get direct services to their local main town centre at Crawley via the Horsham trains which requires a change if the trains are the other way around. It also provides a Service from Norwood Junction and Purley to Crawley. The proposed Thameslink service between Cambridge and Maidstone East is only able to serve either St Mary Cray or Swanley due to insufficient time to enable the train to arrive in time to start its return journey from Maidstone East. Please select which station you would prefer the train to call. This question does not directly affect our services. Do you support proposals to change Sunday services between London Victoria and the West Coastway, to enable faster journeys between London, Chichester and Portsmouth similar to weekdays? Do you support retaining the current hourly service at Plumpton? Do you support reducing the current hourly service at Plumpton to a two hourly to enable a two hourly service at Cooksbridge on Mondays to Fridays, Saturdays and Sundays? In relation to trains between Lewes and Seaford, which option do you prefer? Regular peak service between Brighton and Seaford with direct London to Seaford trains discontinued. Continuation of direct London to Seaford peak trains with a gap of one hour between Brighton and Seaford. Do you support the proposal to operate Southern Mainline services between London Victoria and Hastings only? If this proposal is supported these services would be replaced by an alternative Southeastern train from London Charing Cross which would be extended to and from Ore.
Do you support this proposal? We have taken representation extensively locally and cannot support a proposal that weakens the service from 2012. For Redhill it means a 40% increase in Journey times to Victoria which is not acceptable. The market to Victoria and London Bridge/Thameslink is very different and we forecast very little change as a result of the Thameslink services being able to connect with Crossrail at Farringdon. Passengers from Redhill use the Victoria services not only for Victoria and its connections to the West End but also to connect with South West Trains at Clapham Junction. We have calculated that the journey time to Oxford Circus from Redhill currently 46 minutes but with the amendments suggested would be 57 minutes via Victoria or 55 via Farringdon & Crossrail both significantly longer than current. Redhill has had a half-hourly service to Victoria taking 28 minutes in each direction since the 1990’s and it is an established travel pattern. GTR’s own figures of journeys from Redhill (top 6 destinations) indicate that over half of journeys from Redhill would use the Victoria service. Thus it is vital that Redhill has a Victoria service that takes only 28 minutes from Redhill to Victoria. Millions of journeys every year would be affected by this change. Additionally, the loss of South Coast services has been severely felt in Redhill and the need for these to be replaced is very high. A key improvement expected in the 2018 timetable proposals is an all-day service from Redhill along the Brighton Line and that this has not been included is very disappointing. Especially with the loss of Arun Valley services. The timetable is focussed on providing main line services to London without considering the many journeys that occur between intermediate stations and to the employment centres at Gatwick, Crawley, Haywards Heath and Brighton, plus the high level of leisure journeys to Brighton. Many potential customers are being forced into cars for the journeys adding to congestion where it is not needed. If this alternative is taken then all other services could remain as planned, except that we would swap calling patterns between Gatwick and London Bridge from the Peterborough trains and the Bedford trains from Gatwick for convenience of Earlswood to Horley passengers to get to Horsham as per response to Questions 21 to 33. This would mean that Merstham and Coulsdon South stops would need to be picked up by Thameslink services to London and the benefits of removing that is lost. However, we believe strongly that the slower service should be the 4 trains per hour London Bridge/Thameslink services as the regular nature of the service brings benefit of less waiting times at stations so overall the effect is less. The Reigate/Tonbridge service should be the faster service from Redhill to London. Please see our views on this service in Question 43. 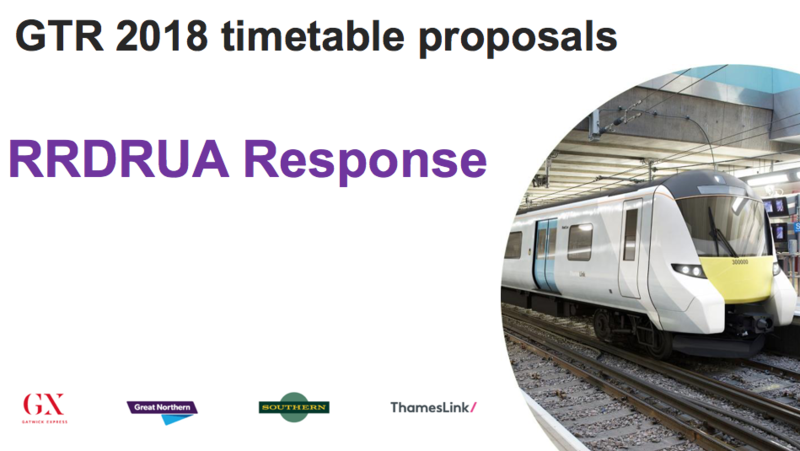 RRDRUA believes that Alternative 1 is the preferred solution as it solves all service provisions and also means the service will be improved from 2012, which the GTR proposals are not. This proposal has a neutral affect. Coulsdon South and Merstham customers are split pretty much 50/50 between wanting London Bridge/Thameslink or Victoria, so to swap from 4 trains per hour to London Bridge to 2 trains to London Bridge plus 2 to Victoria is going to please some and annoy others. The turn up and go aspect of the four trains per hour to London Bridge (and now Thameslink) will be lost and this will probably be missed by many passengers. However, this is offset by having a Reigate service which will be useful for college students and a Victoria service for off-peak passengers who prefer Victoria. We agree with this proposal but it counteracts against our disagreement with the proposals for Redhill to Victoria trains. Our view is that London Bridge trains should call at Merstham and Coulsdon South. We do though believe that there is a strong traffic between Earlswood, Salfords and Horley towards Three Bridges, Crawley and Horsham and to disconnect them would not be in the best interests of passengers. Thus, RRDRUA proposes that the Peterborough to Horsham service should call at Earlswood, Salfords and Horley and the Bedford to Gatwick Airport service should run fast. It would be sensible to swap the stopping patterns north of Redhill too. We appreciate that both sets of trains call at Earlswood, Salfords and Horley during the peak. We think it is also important that Earlswood and Salfords have a service to Victoria during the day and we have proposed this in the Reigate service provision in Question 42. We oppose the new fast service from Purley to Victoria as it means our fast service to Victoria needs to call at Purley which has a disastrous consequence on Journey times from Redhill. We support the idea but not the application. Do you have any specific comments in relation to services between Redhill and Tonbridge? Redhill to Tonbridge services are poorly used in general and mostly only between Redhill and Tonbridge. We don’t see any need to provide additional services here and considerations should be given for Network Rail to build a platform 4 at Redhill saving the need for Tonbridge services terminating at Redhill crossing the main lines. Which option do you support? Reigate station is poorly served by London Trains. Since 2008 when an hourly service was added to London Bridge the usage has since doubled. RRDRUA has surveyed its members who live in Reigate and found just over 50% living in Reigate drive to Redhill/Earlswood or Merstham because of the unreliability of service at Reigate. If a better service could be provided at Reigate around 65% of those driving would walk to Reigate station and catch the train from there. We have also surveyed the shuttle idea, the problem with existing Shuttles is that they get cancelled and all services to Reigate end up being lost. RRDRUA thus totally opposes the use of additional shuttle services. RRDRUA also believes the service from Reigate to London should be half-hourly throughout the day including evenings and hourly on Sundays. This we believe from our research would increase passenger numbers at Reigate by almost 100% and remove traffic from the roads around Redhill and Reigate plus reduce demand for parking at Redhill station. This can be achieved by using splitting of trains from Victoria at Redhill station. As stated before the Victoria to Redhill train should call only at Clapham Junction and East Croydon before Redhill. Once at Redhill it should split, each Half hour the front portion should go to Reigate providing a half hourly service to Reigate from London. In the first half hour, the rear portion should extend to Tonbridge maintaining the existing service, in the second half hour the rear portion should extend to Gatwick, calling at Earlswood, Salfords and Horley providing a new hourly fast service from these stations to Victoria all day every day. On Sundays, this service should reduce to Hourly providing a Tonbridge/Reigate to Victoria service only. This proposal is an actual improvement to services from the Redhill Line, meaning Reigate gets the half-hourly all day service it deserves for the passenger numbers (much smaller stations get better services) and Earlswood/Salfords get a fast service to Victoria 6 days a week. This proposal also reduces a significant problem at East Croydon and Redhill where a 4 coach train arrives from Reigate and is not sufficient for the passengers waiting, by taking up this proposal all services will be 8 coaches and mean that passengers are more likely to be able to get on the service. There are additional comments regarding the provision of Platform 3 at Reigate in our general addendum. These proposals would remove the direct Monday to Saturday off peak journey opportunities from Gatwick Airport, Horley, Salfords, Earlswood, Redhill, Merstham, Coulsdon South and Purley to and from New Cross Gate. Passengers wishing to travel between the affected stations and New Cross Gate would be required to change trains at Norwood Junction. Which station do you travel from? How often do you travel between your station and New Cross Gate? What is your ultimate destination? Generally, the removal of this connection from Redhill Line services is not supported. The connection at New Cross Gate provides a good connection to London Overground services up to Canary Wharf. The connection to these services at Norwood Junction is not as good. There is less than half the London Overground services at Norwood Junction compared to New Cross Gate so onward connection is weaker, plus there are 5 intermediate stations that would not have to be passed through from Norwood Junction. Thus, Norwood Junction stops are significantly less useful than the New Cross Gate stops. We would suggest that the Caterham/Tattenham to London Bridge services call at Norwood Junction and the Bedford to Gatwick services call at New Cross Gate. We agree with the principle that the Monday to Friday daytime service is repeated in the evenings, in particular to Victoria from Reigate and Tonbridge. Our view is that during the evenings and on Saturdays that Reigate needs a half hourly service to London allowing the residents of Reigate to return home easily after theatre in the evenings or days out. On Sundays, we believe this service could be reduced to hourly and interspersed with a through Brighton Service very half hour. The Sunday fast service to Victoria could be provided half hourly by a train from Reigate/Tonbridge alternating with one from Brighton. There is a lot of leisure travel to Brighton from Redhill Line on a Sunday and loss of direct services would not be welcome. Do you have any specific comments in relation to services on Coastway West routes? Operate longer electric trains between Brighton and Eastbourne with connections to and from a two carriage diesel train between Eastbourne and Ashford International. Continue to operate through trains between Brighton and Ashford International with the understanding that current capacity issues on the route are unlikely to be addressed in the short and medium term. Do you have any specific comments in relation to services on Oxted routes? We do though have concern about the East Grinstead services going to Victoria as it means 12 coach trains crossing Windmill Bridge over several flat crossings. Consideration should be given to East Grinstead trains diverting to London Bridge to avoid these conflicts. We propose to introduce a new all day direct train service between Epsom, Sutton, West Croydon and London Bridge, increase the train frequency between Sutton and Epsom Downs (from 1tph to 2tph all day) and continue four trains per hour between Sutton, West Croydon, Norbury and London Victoria? To enable this we will need to remove the current direct train services between Sutton, West Croydon, Crystal Palace and Streatham Hill to enable these improvements. Do you support this? Do you support the proposal to improve overall performance of the network by reducing the number of Monday to Friday and Saturday daytime trains between London Victoria and Selhurst via Norbury from 6tph (every 10 minutes) to 4tph (every 15 minutes)? See answer to Question 45/6. Are you in favour of Monday to Friday and Saturday daytime trains between Streatham Hill, Crystal Palace and Norwood Junction serving East Croydon, Purley and Coulsdon Town instead of West Croydon? Are you in favour of introducing a faster all day service between Caterham and London Bridge instead of a stopping service via Sydenham? This would be a positive move to encourage usage of the Caterham branch which has a large local population..
Do you support the diversion of stopping trains between New Cross Gate and Norwood Junction via Sydenham from East Croydon to West Croydon instead? Do you support the diversion of stopping trains between London Bridge and Selhurst via Peckham Rye, Tulse Hill and Norbury from West Croydon to East Croydon, Purley and Caterham instead? Do you have any other specific comments in relation to South London Metro services? Which proposal do you support? Whilst not recommending it we wonder if instead of Coulsdon Town extension to Reigate or Gatwick via Redhill might resolve other issues. Do you have any specific comments in relation to West London Line services? Thank you very much for your detailed analysis and help with completing the consultation survey. It must have been extremely time consuming.